Do you want to improve your smile? Are you looking for alternatives for braces? Be more conscious about your oral health and get regular dental care treatments from A & S Dental Group in Brandon, FL. We have compiled information that may help you resolve various oral health problems. More teens are choosing to improve their smile without the use of braces. Invisalign is the answer. It straightens teeth using a series of clear, plastic aligners. The aligners put the right amount of pressure on the teeth to migrate the teeth to the correct position. In addition, Invisalign is easier to clean, and works better for a teen's self-esteem. Our staff is trained to handle patients with dental anxiety. We always make sure that you feel comfortable and relaxed during dental procedures. Our highly experienced staff can discuss with you different methods that can help you deal with your anxiety. You may take a tour around our dental office days ahead of your appointment so you can get familiarized with the staff and environment. We hope your visit with us will alleviate your fear of dentists. If you have been feeling too tired and unenergetic to be with friends and family, you may be suffering from sleep apnea. Consult our dental office today to get treated. The condition makes it difficult for your body to receive the right amount of oxygen that it needs to function well. A low amount of oxygen in your body will make you feel sluggish and drained. It is an entirely different condition from sleep disorder. Does your dental problem bring severe discomfort? Have it checked by a dentist immediately to see if you need a root canal. Some cases may only require the removal of the tooth cavity. However, intense pain is often caused by an infection that is severe enough to warrant a root canal. Your gums are just as much important as your teeth. They keep your teeth healthy, strong, and intact. We recommend getting regular dental care to prevent gum diseases. Frequent dental cleaning and treatment will help keep your gums from receding. Make sure that you look great on your school yearbook. We offer cosmetic dentistry services such as Invisalign and Veneers so that you can achieve a smile that can rival any famous celebrity. We offer several options to replace your missing teeth. The ideal replacement option for you may vary depending on your lifestyle. Selections available include implants, bridges, and dentures. Consult our dentist first to evaluate your options properly. Oral cancer claims one life every day in the United States. Take this life-saving measure, and free yourself from having to worry about oral cancer. The disease can impact all areas of your mouth. For this screening procedure, Dr. Cervantes will look for visible symptoms like red and white bumps, hard lumps, rough patches, or changes in the position of your teeth. She will also feel your cheeks and the inside of your mouth using gloves. Preventive care is key to maintaining excellent oral health. Dr. Cervantes will help you create a plan for good lifelong oral health. The basics for oral hygiene include proper brushing of teeth, flossing, and selecting the right mouthwash. We will provide you with all the information you need to prepare for post-op care for dental implants. Before the procedure, Dr. Cervantes has to check that you do not have cavities, infections, or gum diseases. Treatment for those will have to be completed first before the implant procedure. Everyone is at risk of tooth decay. Get dental care such as teeth cleaning regularly to prevent oral health problems from worsening. Preventive dental care can protect you from cavities and tooth loss. In addition, it helps you save money from more costly dental treatments. Do you fear undergoing important dental procedures? Let our dental office alleviate your anxiety. We will make sure that you are comfortable and relaxed throughout the entire procedure. Our office practices sedation dentistry to help those with severe dental anxiety. Sedation will help you relax and can make you feel drowsy. Stop being embarrassed by your smile. We offer dental services that will help you gain confidence in smiling in front of the camera. Dental solutions we offer include teeth cleaning and whitening. You may also try doing facial exercises. If your dentures are damaged, visit our dental office so we can examine them and determine the best way to fix them. One thing you should keep in mind is that your dentures will need to be adjusted once or several times when you first receive them. Ultimately, you should visit a dentist to examine the extent of the damage. But here are some things we recommend you do when you chip your tooth. First, rinse your mouth with warm saltwater to remove debris and surface blood as well as reduce the risk of developing an infection. Then, place a cool rug where your mouth is bleeding. Apply light pressure to ease discomfort. You may use dental cement from drugstores to temporarily cover the damaged tooth. Lastly, make an appointment with your dentist to get everything checked and fixed. Tooth extraction is necessary when you incur dental damage by accident; when an infection is spreading; or when your wisdom teeth are impacted. Your gums may be bleeding because of irritation or because there is a greater health concern. We highly encourage keeping an eye on your gum health. Be aware of gum disease symptoms, and consult a dentist right away when symptoms persist. Are you considering getting dental implants to restore your smile? Dental implants are surgically placed and inserted into the jawbone. One of the questions our patients ask is whether or not they will need a bone graft prior to the procedure. We encourage you to visit our dental office for an examination and X-rays so that we can answer this question based on your health. 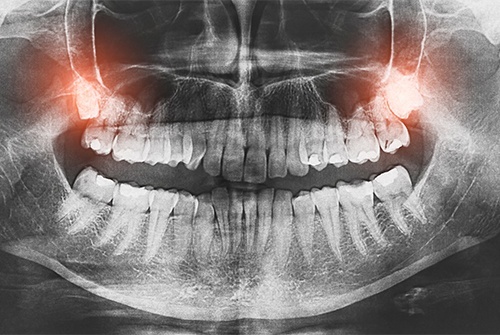 You may not have enough room for your wisdom teeth once they decide to come out. Extraction is necessary when they are impacted because they will bring discomfort, push your teeth forward, and create space for food to be trapped. For this reason, we often recommend wisdom teeth extraction. We want to make achieving excellent oral health easier and more convenient for you. Get all the dental care treatments you need from A & S Dental Group. You are assured of getting first-rate services at reasonable rates. Give us a call today to inquire about our dental services.